Woven hammocks are the ones that I love. These are a bit more traditional in style and some are even colorful. And here’s yours truely having a ball on a roof-top hammock. This entry was posted in Design, garden furniture by Patti Boker Elkon. Bookmark the permalink. 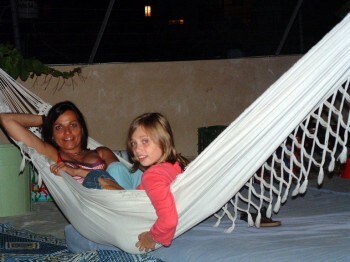 We find more and more of our customers are hanging hammocks inside, in sun rooms, play rooms and children’s bedrooms. 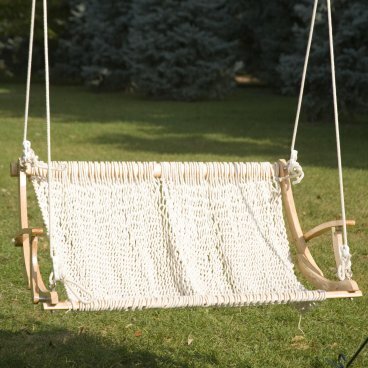 Hammock swings are ideal because they use a lot less space that a conventional style hammock. 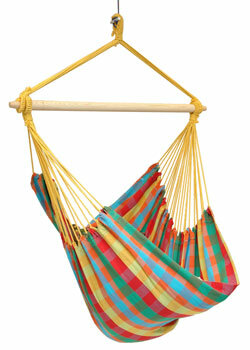 The most comfortable hammock chair on Earth is the Superweave™ Hammock Chair from Green Eggs & Hammocks. 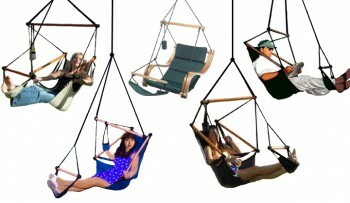 The XCHAIR is the best way to suspend any hammock chair. Check out the 73 customer reviews on Amazon.com. Just search ‘xchair’ and see what everybody is saying. All hammocks are NOT created the same. Rest in the Best!